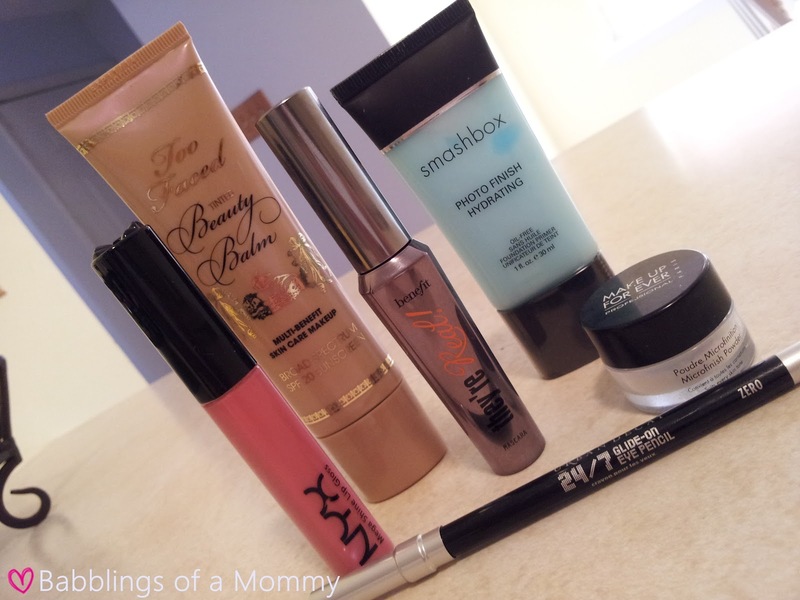 Babblings of a Mommy: 6 Make-Up Products I Currently Can't Live Without! 6 Make-Up Products I Currently Can't Live Without! My make-up arsenal is constantly changing, but they are few products that I truly love and keep going back to. Some of them are newer finds, and others I've been using for years, but either way - here are 6 products I currently can't live without! I know I've mentioned a few beauty balms here before, but this is hands down my absolute favorite one! It has a really nice texture and leaves your face dewy and gorgeous! I've been using this for years! It's my signature lipgloss and no it's not "beige", it's a soft pink (similar to NARS Turkish Delight) I love it because it super shiny, non-sticky, and you can't beat the price! I've tried a ridiculous amount of mascara trying to make my lashes long and thick (two things they're unfortunately not) But this product has changed everything for me. It makes my lashes look big and full without giving spider lashes. I absolutely love it to pieces! This is a like magic in a bottle. It's a translucent finishing powder that makes your make-up look flawless and goes on any skin tone. Another product I've been using for years, but why mess with a classic? Hands down best smudge-proof eyeliner. Period. 2) Lorac TANtalizer- it's awesome, it gives you that perfect bronze color without it looking too dark. 3) too faced shadow insurance- this is an illuminating eye shadow primer that gives you that perfect tone underneath your eyeshadow. I sometimes even use it alone. Sephora, not sure of the price I got it in a set along with some eyeshadows and máscara. 4) Origins - mulberry eyeliner (06) beautiful brownish-copperish color that looks great with brown eyes. 5). Hard Candy- $1,000 lashes. I absolutely love love love this lash primer, trust me I have tried a million of them and this is by far the beat I have tried. It has some type of fiber that elongates your eyelashes immediately. Offcourse since its white you cannot use it alone you must use máscara afterwards. Believe it or not....... Walmart $10!!!!! 6). Bare essentials- buxom lash. This is the best mascara I have ever tried, I have gone from brands like loreal through more expensive ones like Dior and pretty much everything in between and i got to say this is the best one ever!! I have the Too Faced Shadow Insurance too. I go between that and the Urban Decay Primer Potion. That Hard Candy product sounds interesting! I might have to pick that up and see how it works with my benefit mascara.